Mini SEGA Genesis + SEGA CD + 32x deluxe set - 3D Printed! 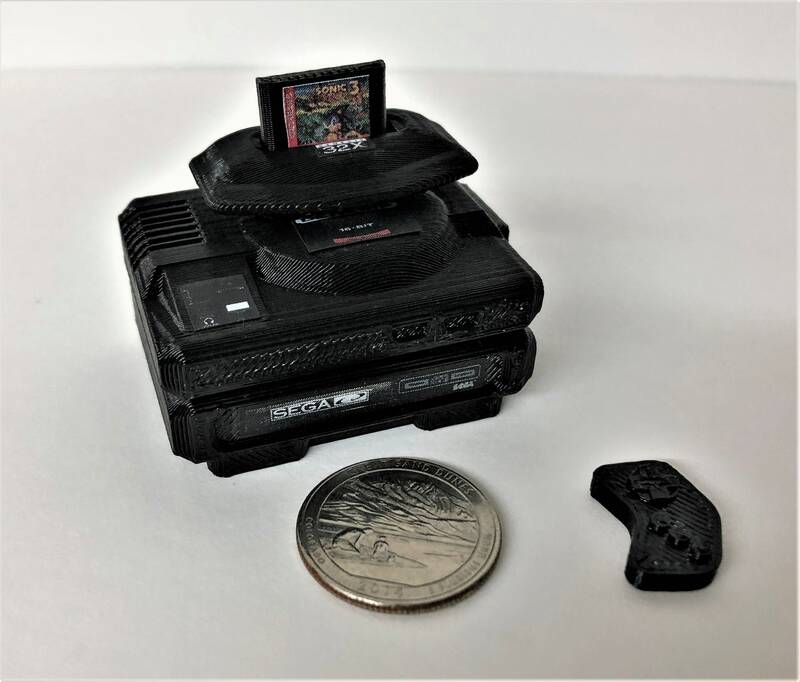 This tiny, 2" wide Mini SEGA Genesis set was designed using open source CAD software, 3D printed on a Makerbot Replicator, and hand painted and assembled. A great addition to your desk or studio. Includes one Genesis console, one SEGA CD (version 1), one 32x, one cartridge, and one controller. You can pose these separately. Includes a tiny fact sheet with trivia on the original machine. Not suitable for ages 5 and under due to small parts. Mini Atari VCS/2600 Deluxe Set - 3D Printed! Mini ColecoVision - 3D Printed! Mini Atari 5200 Super System - 3D Printed! Mini SEGA Genesis - 3D Printed! Mini Nintendo Super NES (SNES) - 3D Printed! Mini SEGA Genesis 2 - 3D Printed! Mini Mattel Electronics Intellivision - 3D Printed! A+, their sets are very nice! Mini Nintendo NES - 3D Printed! Mini Nintendo N64 - 3D Printed! Mini SEGA Dreamcast - 3D Printed! Mini SEGA Megadrive - 3D Printed! Mini TRS-80 Model 4D - 3D Printed! Mini Atari 520 Deluxe Set - 3D Printed!